I have a new overnight oats recipe for you! This time it’s peach pie overnight oats. 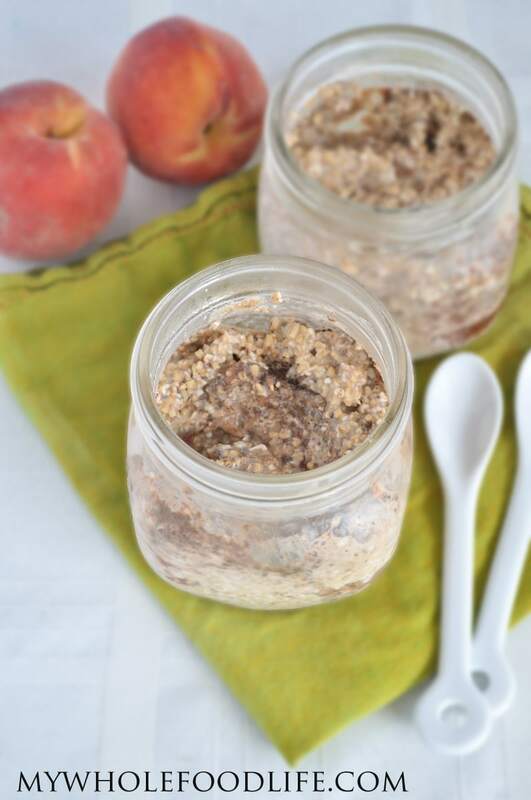 These peach pie overnight oats came out very good. I pureed my peaches to put in this recipe, but you could also add chunks of peaches instead if you like. One of the best things about overnight oats is that there is no cooking required! I make 5 at a time for easy breakfasts all week. You can eat them cold or hot. I eat them cold and it actually reminds me of cold cereal. If you wanted to make these more of a peaches and cream oats, you could add in some plain yogurt or cashew cream. Yum! A super east breakfast option that travels well. Mix all ingredients in a jar and stir well. Place the covered jar in the fridge overnight. I make 5 at a time with no issues. The steel cut oats will retain a little crunch. I personally like the crunch, but if you like a smoother oatmeal, use rolled oats. If you find the oats are a little dry in the morning, you can just add some more milk. Enjoy! I can't wait for peaches to get to the farmer's market. I love how easy overnight oats are. Make busy morning much less hectic. Thanks Janel! I hope you enjoy the recipe. I have been really into hemp hearts lately. They are super good for you. You can use flax meal in place of hemp hearts if you like. I think that could work fine. Your recipes are almost always tried in my kitchen. They come out well always! But I'm started to realize that I have intestinal issues with my gluten free (therefore expensive) organic oats. What a ridiculous annoyance! Oats are SO versitile... Anyone have a good replacement for oats in gluten free organic cooking? Thank you! You can make overnight oats with buckwheat groats or millet. You will just need to soak the groats before using in the overnight oats recipes. For baking, you can try using gluten free all purpose or buckwheat flour. What size jar do you use? Does it matter? Can you use plastic? Thanks! I used a 12 oz mason jar. There was still plenty of room left for stirring. You can really use any jar you like. HI this sounds really good. Have you figured out nutritional info for? where do you get hemp hearts? Sorry I'm always asking these questions - just trying to get my arms around these new to me ingredients. You can find them at most health food stores. I also link to Amazon in the post if you can't find them anywhere else. oh and also... i thought all oats were gluten free? Some oats are cut on the same machines as oats that process wheat. So if you are celiac, I recommend looking for certified gluten free oats. I made two peaches' worth of this last week and really enjoyed it! I need to find out the proper way to cut up peaches, though, as I always have the hardest time getting the flesh off the pit... Anyway. This is the first time I've used hemp seeds. (Apparently Hemp Hearts is just a particular brand? A very helpful stocker at Walmart looked it up on his phone while I was frantically looking for hearts. Another, though small, reason to buy into the smart phone movement...) I don't think I could taste them, and they were easy to overlook texture-wise unless I was really paying attention. When I was paying attention, though, they added a bit of texture that was reminiscent of crust. I appreciated that. I need to look up the health benefits of hemp at some point... This was a very clean, light overnight oats. I would definitely recommend it at least in the version with peach chunks. I hate using appliances so I didn't puree. I'm sure that would taste different, and maybe one day I'll try it out. Thanks so much for the recipe!